Post the launch of the latest iPhone XS and XS Max, there’s no denying that Apple slowed down older devices including the iPhone X to preserve battery life, but an iPhone X has apparently overheated and caught fire in the process of updating to iOS 12.1. This is certainly unheard of and is a first-of-its-kind occurrence. 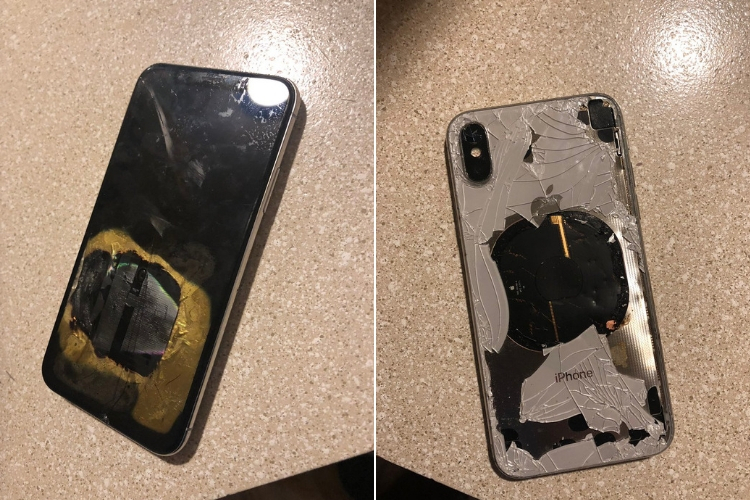 The burnt-up iPhone X, as seen below, is said to belong to Rahel Mohamad from Federal Way, Washington in the United States. The 10-month-old device that Rahel bought in January overheated (it was hot to the touch and he dropped it), started emitting smoke, and ultimately, caught fire ‘as soon as the phone turned on’ after the update. With the caption, “Apple iPhone X just got hot and exploded in the process of upgrading to 12.1 iOS. What’s going on here?? ?,” Mohamad tweeted about this burned up iPhone X this morning. The pictures show-off the totally shattered rear panel, with the wireless charging coil peeking through. The bezel-less screen has also suffered the same consequence and is now convoluted. In additional pictures, Mohamad confirmed that he was using an official 12W USB wall adapter and cable to charge his iPhone X. Often times it’s unofficial accessories that are to blame for the device overheating, and catching fire, but that doesn’t seem to be the case here. Apple responded to Mohamad’s tweet saying it’s ‘definitely not expected behavior’ and the Cupertino giant is now going to further investigate the issue at hand. Mohamad’s been asked to ship the burnt iPhone X over to them. Since nothing looks out of place, we’re unable to pinpoint what could’ve gone wrong and will have to wait for official info from Apple.